Overview: 4% APR on all balances up to a year during deployment or PCS; No foreign transaction fees outside the U.S.; No penalty APR or annual fee; Purchase APR 7.90%-24.90% Variable. If you are part of a military family or are on active duty, the USAA Rate Advantage Visa Platinum® offers some very attractive benefits specific to your needs. When you or your spouse is on deployment or permanent change of station, you'll receive a lower than average 4% APR on all balances for up to a year. But you're also going to get a 4% Service members Civil Relief Act APR rate on any balance you have before entering active duty, for up to a year after your active duty is completed. Another military perk? 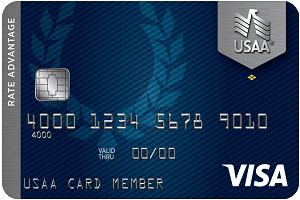 The card grants you a rebate on all charges accrued when you were serving in a qualified military campaign. This card also offers benefits and rewards for traveling and retail shopping. If you travel outside the United States, you won't have any foreign transaction fees to worry about. Collision damage waiver coverage is included to cover theft and physical damage to most rental vehicles. Additionally, cardholders will receive an extended warranty on any U.S. store brand or manufacturer warranty for up to 12 months. The USAA Rate Advantage Visa Platinum® is also more forgiving than other cards when it comes to missed payments. If you are late on a payment, your APR will not increase. That missed payment can still show up on your credit report and ding your score, but you won't deal with a penalty APR like you would with most cards. You also won't pay an annual fee with this card. Active duty service members get the best bang for their buck with this card, so take that into consideration if you're thinking about applying. This card isn't flashy and it doesn't come with hefty rewards or sign-up bonuses, but what it lacks in frills it makes up for in solid long-term benefits and affordability. The USAA Rate Advantage Visa Platinum® ranks high in customer satisfaction time and time again, and it's a natural fit for active duty service members. With no annual fee, no penalty APR and low purchase APR, it's a top choice for a practical, reliable card.